Planet of the Apes Astronaut 8 Inch Action Figure-Fully Poseable-Asst.No.1960-Mego". Mint on card in unopened package. I have four other similar figures listed this week. "Planet of the Apes Soldier Ape 8 Inch Action Figure-Fully Poseable-Asst.No.1960-Mego". Mint on card in unopened package. I have four other similar figures listed this week. "Planet of the Apes Peter Burke 8 Inch Action Figure-Fully Poseable-Asst.No.50902-Mego". Copyright 1975. Mint on card in unopened package. I have four other similar figures listed this week. Up for your purchasing pleasure we have a very rare vintage MEGO, Planet of the Apes Dr. Zaius. This Dr. Zaius comes from the 1974 release of the Planet of the Apes line. Dr. Zaius is un-punched and on the Palitoy-bradgate card. The card is in very good condition, the front is very clean and in excellent condition the front has no creasing of the card. The bubble is in very good condition and has very small ding in the left upper portion of the bubble and as crease on the lower right of the bubble. The back is in fantastic condition and has a little to no shelf wear. The toy comes from a personal collection that was kept in a very clean, pet, and smoke free environment. Other than the mentioned very minor flaws this collector’s item is in extremely good condition. Hello- Welcome!- Here we have a vintage "Mego" figure from their "Planet Of The Apes" line of figures and toys, produced back in the early through late 1970's. This one is of the "General Ursus (Green Card)". The figure is in mint/unused condition, though the backing card does have a few creases with roughly a 3" horizontal crease on the upper portion of the card, and a 2" crease running vertically in the same near area. We tried our best to take pictures focusing on the creases, but they were hard to show-up in the photographs, but they ARE there, and want to make you aware of this! The figure is the last from a factory case we purchased many, many years ago. We consistantly sold these for $250.00-$300.00 apiece, but being the last one, and with the card creasing, we will drop an additional $50.00 off of our lowest price for this piece! Not a candidate for "AFA" grading due to the creases, but still DOES display beautifully, nonetheless!!!! A nice example of this figure to add to any serious "Mego" and/or "Apes"collection! Again, the packaging is not mint, but altogether does display nicely, and offered at a fair price. (*****Please note- the empty factory case (pictured with the figure) is NOT included, and has already been sold!........Any questions on this item, or on any of our other items we have up for auction, or for sale in our Ebay Store, please feel free to ask!.......Shipping $10.00, & (Includes "Delivery Confirmation", & INSURANCE for the purchase price of the piece), to anywhere in the Continental U.S.............Payment via Paypal.........Thank You, & God Bless! 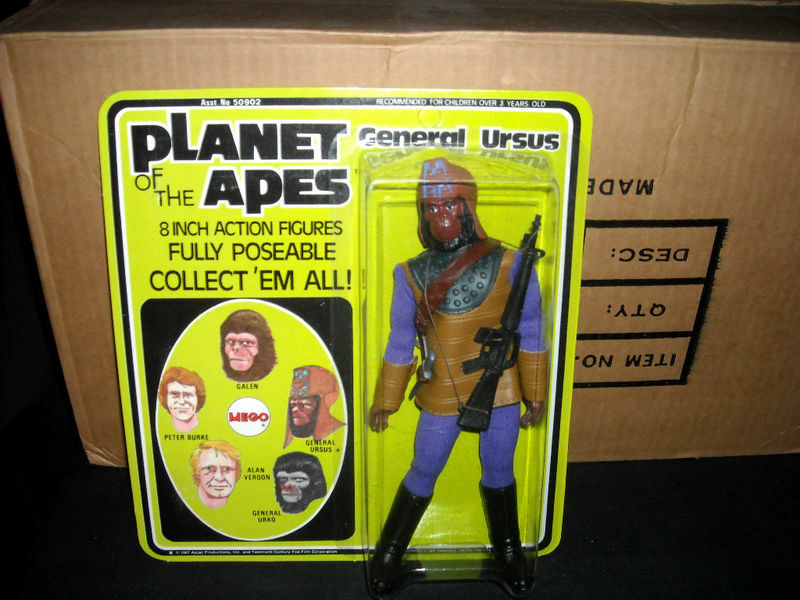 Here is a Mego 8" Planet of the Apes Soldier Ape. He is complete. He is 100% ALL ORIGINAL vintage 1970's Mego from head to toe, guaranteed. Beautiful, mint condition, no play wear at all. Original Mego Body is tight and completely intact, no defects. This is the early issue type 1 body style. Head is clean with no wear at all, very nice. Original vintage Mego bright blue leather top has no runs, no seam splits, no holes, no stains and snaps intact on back. Brown sleeves minty clean with no defects. A premium quality vintage top for sure, and a rare one. Original vintage Mego gloves are clean and show no signs of wear, display well as seen in the pics. Original vintage brown Mego tights are pristine/ clean, superb quality, tight waist elastic, perfect. Original vintage Mego black boots are clean with no splits or dents, perfect. Original vintage Mego black rifle is also perfect, has the original string well attached, very nice. Original vintage Mego bandolier is in mint condition shape, fits across his chest beautifully and completes this awesome Planet of the Apes figure. Planet of the Apes type 1 Soldier Ape, in superb/ MINT condition from top to bottom and ALL ORIGINAL Mego. Displays beautifully! This is your chance to add to your collection something rare, a real collectors item. I believe that this playset is complete. The reason I say this is when it was purchased, I bought it believing it was complete. I have not put all of this together in fear of degrading its condition. The box it comes in is full of pieces for it. It comes with its box but as you can see, it is in rough shape. But this is really a neat set. The pieces all seem to be in very good shape. 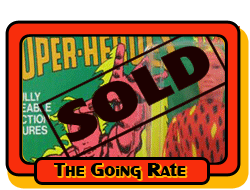 You are bidding on a MOC original Mego Planet of the Apes Galen figure Card is punched, has slight bubble separation/warping at the bottom of the bubble, has 2.67 written on the front of the card. Card is otherwise a solid C-7. Beautiful original planet of the apes urko (green card) action figure. NRFB never opened and unpunched. Both card and bubble in near mint condition. Figure mint.